Messaging has replaced the phone call as the most preferred form of communications for consumers and businesses alike. As a result, message volumes have skyrocketed in the last several years—and not just among the young. Even baby boomers 55 and over average 15 or more messages per day. Unfortunately, SMS and MMS messages sent via mobile phone are not encrypted. Consequently, government, health care, and other industries using mobile phone messaging are prime targets for hackers. Using snooping equipment to spoof the nearest cell phone tower, hackers gain complete access to private SMS and MMS content. Because hackers typically pass all intercepted traffic through to the tower, the victim is completely unaware his text and content have been compromised. First of all, MessagePro Secure can protect your organization from these risks. Users need only download the MessagePro Secure application, or log into the MessagePro Secure web site. Because MessagePro Secure encrypts all messages, your content remains private. 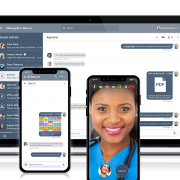 Furthermore, MessagePro automatically encrypts attached files, topic-specific group chats, one-on-one chats, videos, and live audio communications. 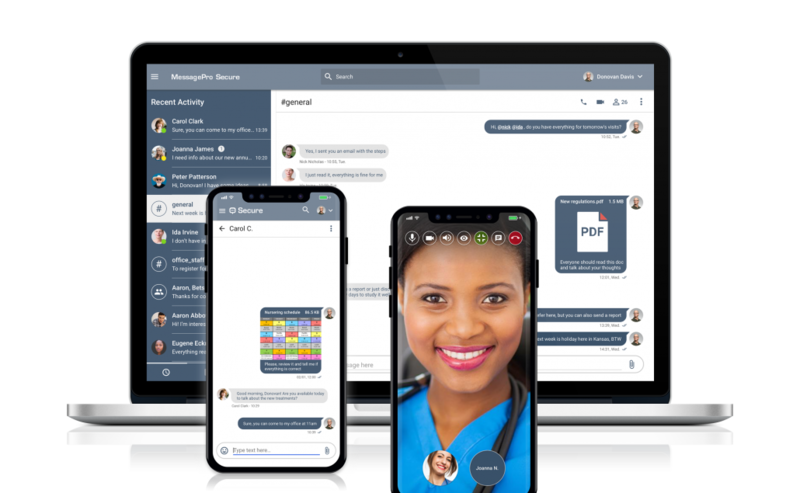 Typically heavy users of messaging, medical personnel are subject to the Health Insurance Portability and Accountability Act. HIPAA regulations impose stringent requirements on the types of medical information personnel may share using unsecured communications services. Consequently, a simple message can violate HIPAA guidelines, subjecting users to significant liability. Fortunately, MessagePro Secure encrypts every message, insuring HIPAA compliance. MessagePro is simple to deploy. Because the service is intuitive, most users don’t require training (help is available). Users may download an iOS or Android application (MessagePro Secure). Using a browser, the administrator sets up a directory with a shared contact list. Also, MessagePro includes great reporting, logging, and search functions. Pricing starts at $7.95 per month for smaller teams with volume pricing discounts available. Finally, setup is almost instant—users simply receive an e-mail with credentials.